Following the success of last year’s joint volunteers awards, Middlesex Rugby will again be combining with the Mitsubishi awards at the Spirit of Rugby, Twickenham Stadium, on Friday 8th June 201. In order to simplify the nomination process, there will be no separate nominations for the Individual Middlesex Volunteer Awards. All nominations into the Mitsubishi Motors Volunteer of the Year Awards will also be considered for the Middlesex Rugby Volunteer Awards. 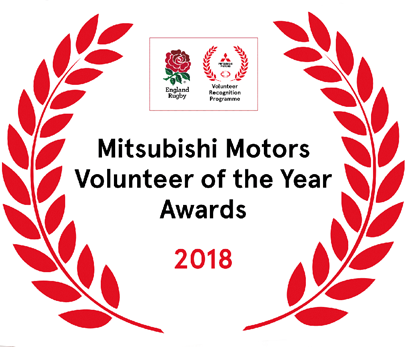 Over the past twelve months, Mitsubishi Motors’ support has helped the RFU enhance the volunteer recognition programme while also bringing a number of new and exciting opportunities, including the Volunteer of the Year Awards, which aim to identify and thank volunteers for their valuable and outstanding work across the game in clubs, referee societies, schools, colleges and universities. No matter what the role – on or off the pitch, behind the scenes or on the committee, the RFU and Mitsubishi Motors want you to nominate the volunteers who are doing a great job – day in, day out. Last year over 1500 entries were submitted for the Mitsubishi Motors Volunteer of the Year Awards as volunteers up and down the country were identified for their valuable work across the game. The four winners were announced at an awards evening at Twickenham Stadium, where they were awarded a Mitsubishi Motors vehicle of their choice, to keep for a year. We want to recognise volunteers who have made a great contribution to their club and community during the past 12 months, so please share the word and let us know about the people who have made a difference and deserve to be recognised for their achievements. Selected volunteers, plus guest, will then be invited to attend one of up to 42 local events at Mitsubishi Motors dealerships and Rugby Clubs from April – June 2018, at which recognition prizes will be awarded. One finalist from each event will then be invited to the awards evening at Twickenham Stadium on Friday 7th September where the overall winners will be announced. Nominations will open at 12pm on Tuesday 9th January and close at 12am on Sunday 25th February 2018.